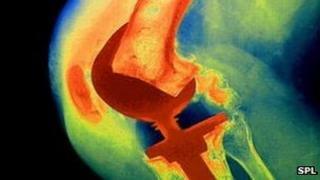 Data suggests there has been a big rise in knee replacement operation rates, particularly for younger patients. Figures for the UK, US and Finland show an emerging trend of requests for arthritic 'baby boomers' in their 50s. UK experts believe the nation's growing obesity problem is partly to blame for the rise, putting strain on the knees. A report in Arthritis & Rheumatism says work is urgently needed to check that replacements in this age group is wise given the product's unknown shelf life. The durability of the replacement knee joints has only been assessed in patients in their 60s, 70s and 80s, not in their 50s. Best estimates suggest the joints last for about 15 years in these "older" and often less physically active recipients. Surgeons say it is possible younger patients might wear out their replacements even faster than this. Arthritis Research UK is currently investigating the success rate of knee replacement surgery in this younger age group. The charity wants to ensure that the artificial knees being implanted today can last 30 years or more. Its medical director, Prof Alan Silman, says knee replacement operations carried out in the UK now outnumber hip replacements, with almost 90,000 operations performed in 2010 - an increase of 5.7% on the previous year. "More knee replacements are being performed because the population is getting older and more obese - two of the main causes of knee osteoarthritis - but also because they are increasingly being carried out on younger people, under the age of 50." He says younger patients are more aware about what medical procedures are available to them and are more likely than past generations to demand treatment. "Patients with osteoarthritis knees now demand more in terms of what they can do, and in order to achieve that - to keep on playing sport, for example - they not unreasonably demand earlier surgical intervention. "However, in patients who continue to expose their new joints to demanding activities, we need to investigate if the new joint is more likely to fail early." The experience is similar in Finland. Dr Jarkko Leskinen, an orthopaedic surgeon at the Helsinki University Central Hospital, has looked at the cumulative incidence of knee replacements in the country over the past three decades and has found a rapid rise in the surgery for patients in their 30s, 40s and 50s. "It is worrying because we do not know the longevity of the replacements in younger patients. We may face problems in the near future because of this." Prof Silman agreed, saying: "We may well be faced with doing a lot more replacement revisions when these patients reach their 70s." But he added: "Joint replacement design and surgical technique are improving all the time."